Over-modification of aluminum silicon alloys is mostly caused by too high addition quantities or too much concentrated addition of modifiers or too slow dissolution or distribution of the modifiers in the melt. The latter cause may lead to local over-modification. Over-modification by too high quantities of modifiers can be prevented if the dosage guidelines are observed correctly. Local over-modification of the melt can be prevented by proper melt handling and quick distribution of the modifier over the entire volume of the melt (immersing, mixing, injecting...). Sodiumover-modification leads to a very poor melt quality with subsequent defective casting. 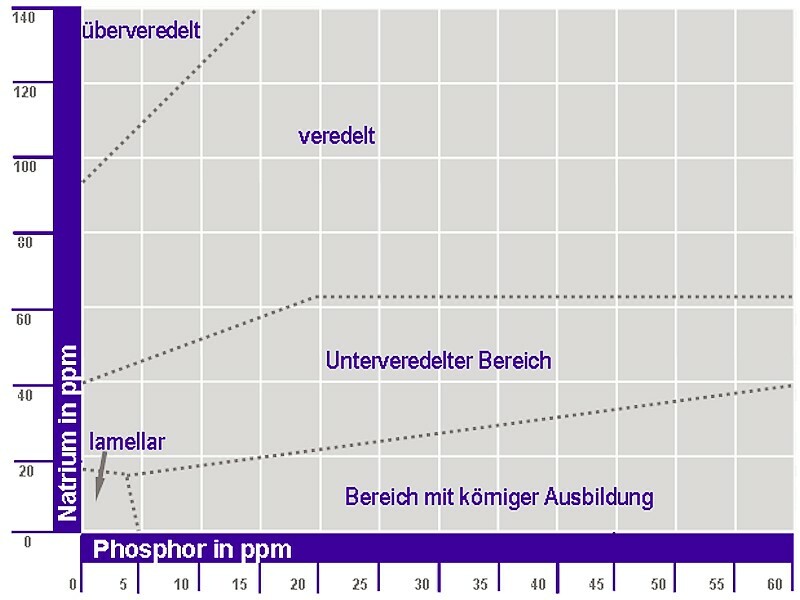 Depending on the solidification rate, the type of alloy and the phosphor content, Na over-modification may already occur at concentrations of 120 ppm Na in the melt (Fig. 1). This leads to high hydrogen absorption (see Hydrogen solubility) and increased tendencies for cavities. Due to over-modification, residual melt bands occur in the casting structure along the eutectic grain, that also increasingly contain new sodium-containing and intermetallic phases (Fig. 2) or coarsened eutectic silicon apart from iron and titan-containing phases. 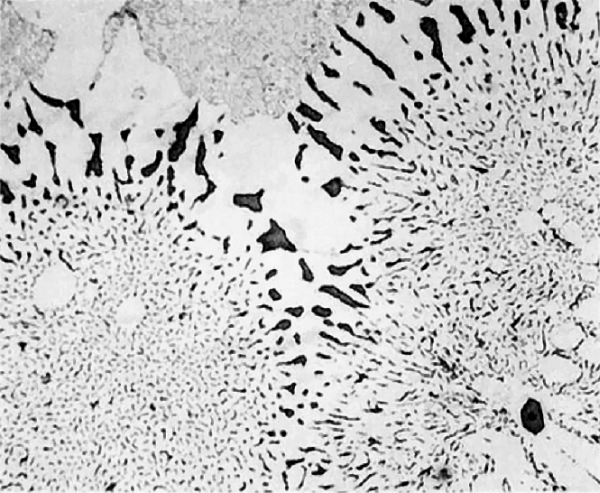 The microscopic appearance can be compared to a “leopard pattern” (“leopard patternstructure”, Fig. 2). Subsequent addition of unmodified material to an over-modified melt cannot completely correct the occurred over-modification. For this reason, over-modified melt should be discarded. Also local Na over-modification reduces the quality of the melt and decreases internal feeding in the casting. Once over-modification has occurred, this cannot be reversed as the intermetallic phases of the sodium, iron and titan remain intact due to the high melting point. These form the intermetallic plates in the structure and accumulate locally (ferrous plates). Locally poor melt quality may remain in the otherwise correct melt and leads to the formation of pores directly under the casting surface in horizontal areas in the mold. For this reason, these pores do not become directly visible after casting and can only be identified after blasting. Sr over-modification has a significantly lower impact on the casting quality than Na over-modification and does not influence the quality of the melt as excessive Na concentration does. Additionally, Sr over-modification only occurs at significantly higher quantities. At very high Sr quantities (> 500 ppm), the Sr is dissolved from the Al2Si2Sr type and can no longer have an impact on modification. This leads to a grainy (Al+Si) eutectic in the casting despite the high concentration of Sr in the melt. Occasionally, also inter-dentritic post-feeding is affected and a white color is observed at the surface of Sr over-modified castings.